The band was the first ever to play in South American stadiums, breaking worldwide records for concert attendance in the Morumbi Stadium in São Paulo in 1981. In 1986, Queen also played behind the Iron Curtain when they performed to a crowd of 80,000 in Budapest, in what was one of the biggest rock concerts ever held in Eastern Europe. 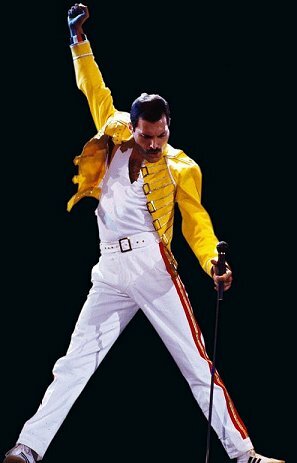 One of Mercury’s most notable performances with Queen took place at Live Aid in 1985, in front of an audience of 72,000 people, and has since been voted by a group of music executives as the greatest live performance in the history of rock music. Mercury’s final live performance with Queen took place on 9 August 1986 at Knebworth Park in England & drew an attendance estimated as high as 300,000.Mercury sadly passed away on 24th November 1991 of bronchopneumonia brought on by AIDS on 24 November 1991, only one day after publicly acknowledging he had the disease & Deacon retired in 1997. Since then, May and Taylor have infrequently performed together, including a collaboration with Paul Rodgers under the name Queen + Paul Rodgers which ended in May 2009. They also performed at the Olympic Closing Ceremony in 2012, together with a recording of Freddie Mercury in the background.